This bike is an easy handling around town ride. It steers confidently with or without a load in the front basket, and has rack mounts on the rear if you need to carry more stuff. Honestly, there’s no reason you couldn’t go a few days touring on this bike. But its main purpose is year round city riding. Leaves, snow, rain, darkness, no problem. 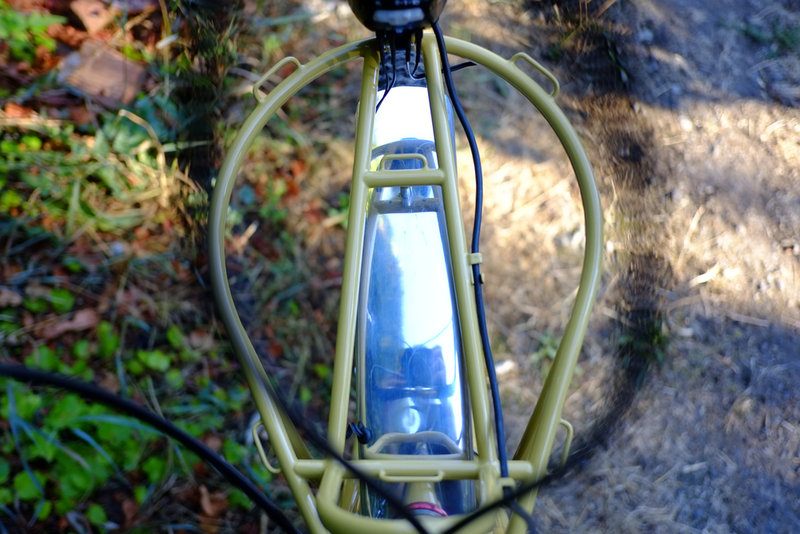 I kept the light wiring in the frame and out of the fenders so in the summer you could remove the fenders and pare down your ride, install knobby tires if you wanted and hit the trails. The Pinion gearbox is worry free and mostly maintenance free, and Gates belts are known to last upwards of 25K miles, so you ought to be able to go a few years before needing to replace anything on this bike but tires and brake pads. If this bike was custom made for a specific person, I would charge in the nature of $10K for the full build, including all my time, fit and design, parts, labor, and the paint. I built it for the bike show, as a place to hang cool new parts, and show off my mad skills as a bike and rack builder. Also, I wanted to see how much time I could spend modifying and transforming a basic, inexpensive basket into something exotic and expensive. Because I didn’t have all the time into customer interactions, though, you have an opportunity to get a deal. The price I’d like to get for this bike is $8300. If you pay cash, I’ll part with it for $7999. That’s right — cash talks. First time using this prototype Pinion mount. Customized design made to shorten chain stays as much as possible and to leave clearance for fatter tires. 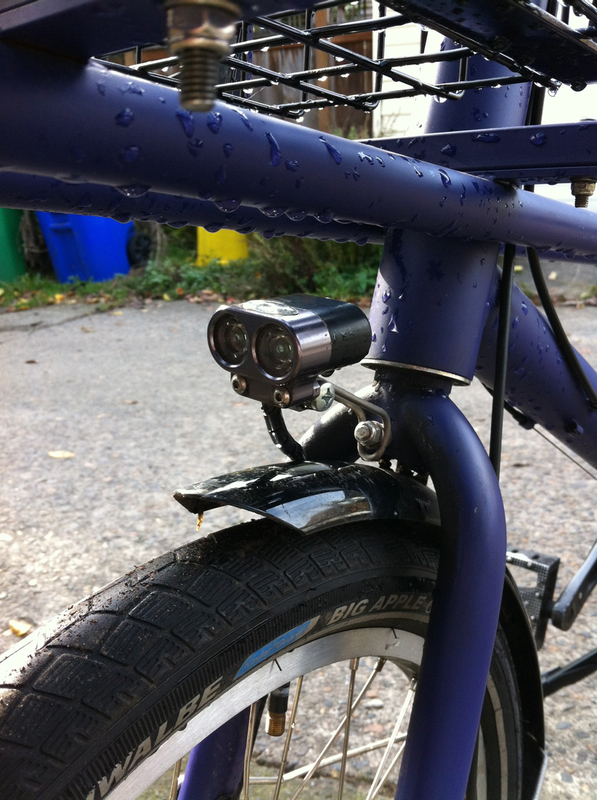 This is the first bike with this mount, and it works awesome! Pre-production shifters by Cinq5 are an excellent alternative to the twist shifter, which at this point is the only other option for shifting the Pinion Gearbox. I’m not a big fan of twist shift, and I’ve been waiting for these paddle shifters for almost three years. They won’t be “officially” available until later this year. The company who made these is German, and there are not too many of these shifters yet in the USA. Fenders: I ordered these from Honjo more than two years ago, knowing that I needed to make a bike around their super width (80 mm!). These fenders finally landed in the USA in January of this year. This is the first set I’ve installed on a bike. And, I had them anodized, so at this point, they are the first of their kind in the states. Ahearne/MAP handlebar with the 31.8 mm clamp is new as of February this year. Same great design, now with the “oversize” clamp option. This is the first set I’ve used on a bike. Modified Wald basket. This is the first time I’ve cut one down in this way. I feel like it’s a more practical height. It’s cool, but I may never do this again, because it’s kind of ridiculous how much time I spent on it. Unique paint scheme and minimal branding on the bike. This isn’t my usual style, but I like it! 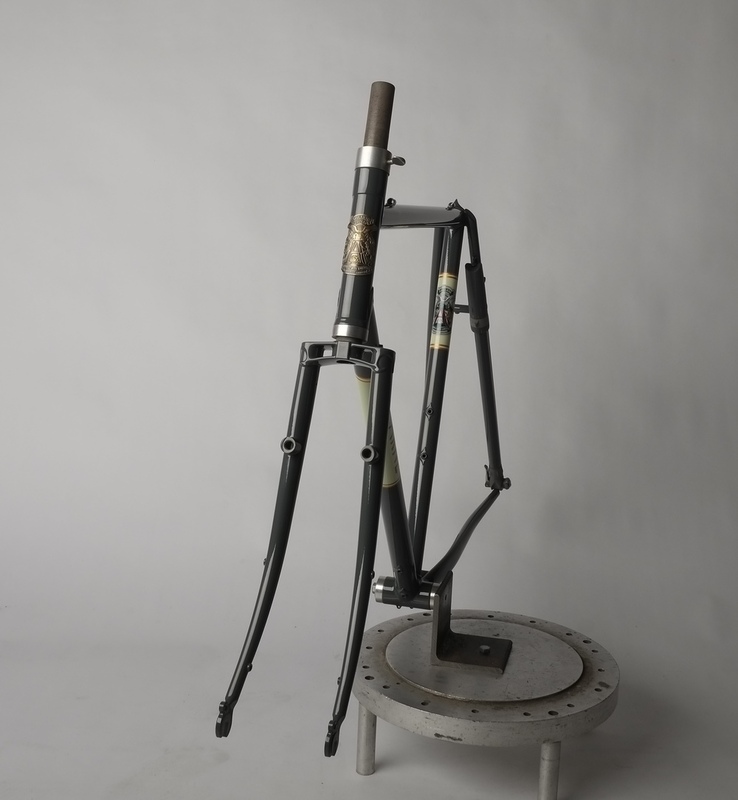 Fork: Reynold’s 853 heat treated, pre-bent fork legs, and 853 1 1/8” straight steerer. Main tubes are a mix of Columbus, mostly Zona.